Seaweed may look like slimy spinach, but this dense green or brown sea vegetable is high in nutrients and packs a variety of health benefits. These include digestive health, cholesterol-lowering effects and weight loss. 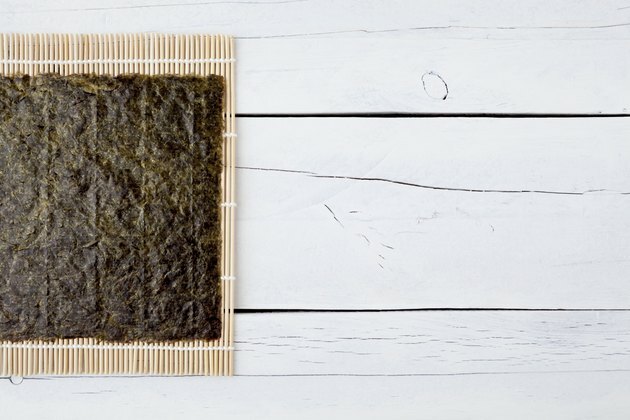 Get your daily dose of a number of essential minerals and vitamins with only a small amount of seaweed such as nori, kelp or kombu. Alginate, the natural fiber found in some types of seaweed such as kelp, might help digestion and reduce fat absorption. A study led by scientists Dr. Iain Brownlee and Professor Jeff Pearson at Newcastle University found that eating seaweed reduced fat digestion by more than 75 percent. Fiber also helps you to feel full faster and prevents overeating. These findings indicate that adding seaweed to your diet could help you lose weight and lower unhealthy cholesterol levels in the blood. Like other vegetables, seaweed contains essential minerals and vitamins you need to get in a healthy, balanced diet. According to the site Best Health, only a gram of seaweed provides your daily dose of iodine, a mineral that is critical for healthy thyroid function. Additionally, a type of brown seaweed called kombu contains the pigment fucoxanthin, which may help your body metabolize fats for energy. Best Health also reports that a serving of seaweed is loaded with more calcium than broccoli and is almost as rich in proteins as legumes. Other nutrients in seaweed include vitamin B-12 and vitamin A. Your body requires healthy fats as an essential part of a balanced diet. Seaweed provides heart-healthy fats called omega-3 fatty acids. The Dr. Oz Show website notes that a sheet of nori seaweed contains the same amount of omega-3 fatty acids as two avocados. This type of fat helps to raise healthy HDL cholesterol levels, while lowering harmful LDL cholesterol levels. Omega-3 fatty acids also help reduce inflammation in the body. There are several ways to add seaweed to your regular diet. Flattened nori seaweed sheets are used to roll sushi. You can add them to a wrap or tuck them inside a sandwich or cut them into strips and toss into a salad or soup. Purchase dried brown or green kelp seaweed strips and add them to breads, pizzas, potatoes, pastas, casseroles, stews and soups. Or make seaweed chips by drizzling olive oil onto fresh seaweed pieces and baking until crisp.